This change is being fueled by the fact that laptops keep getting smaller, and so their internal space is restricted and no longer accommodate larger storage devices. This guide looks at all the various types of drives that may be in a laptop, and what they can offer. 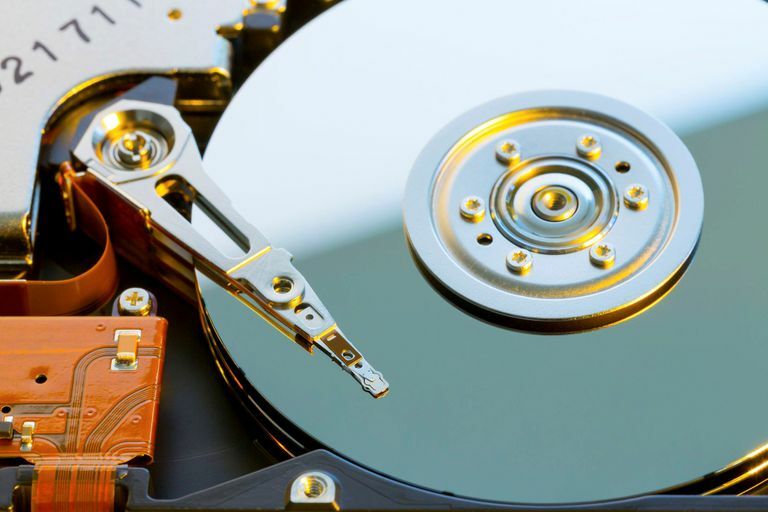 Hard drives (HDDs) are still the most common form of storage in a laptop and are pretty straightforward. If you're looking at a laptop to replace your desktop as your primary system that will hold all your documents, videos, programs, etc., consider getting one with a hard drive that's 750 GB or larger. The downside is that SSDs don't come in such large capacities as traditional hard drives. Plus, they usually cost a lot more. A typical laptop equipped with a solid state drive will have anywhere from 16 GB to 512 GB of storage space, although there are some available with more than 500 GB they are prohibitively expensive. If this is the only storage in the laptop, it should have at least 120 GB of space but ideally around 240 GB or more. The type of interface that the solid state drive uses can also have a significant impact on the performance but many companies do not overtly advertise it. Most inexpensive systems like Chromebooks tend to use eMMC which isn't much more than a flash memory card, while high-performance laptops use the new M.2 cards with PCI Express (PCIe). For more information on solid state drives in computers, see our Buyer's Guide to Solid State Drives. If you want higher performance than a traditional hard drive but don't want to sacrifice storage capacity, a solid state hybrid drive (SSHD) is another option. Some companies are referring to these as just hybrid hard drives. Solid state hybrid drives include a small amount of solid state memory on a traditional hard drive that is used to cache frequently used files. They do help speed up tasks such as booting up a laptop but they aren't always faster. In fact, this form of drive is best used when a limited number of applications are used on a frequent basis. Similar to hybrid hard drives, some laptops are using both traditional hard drives with a small solid state drive. The most common form of this uses the Intel Smart Response Technology. This provides the benefits of the storage capacities of the hard drive while gaining the speed benefits of a solid-state drive. This is becoming much less common now that prices for SSD's continue to drop. These days, they're used more for watching movies or playing games, as well as burning programs to a disc, creating DVDs, or building audio CDs. If you do need an optical drive, what type of drive should you get on a laptop? Well, whatever you end up getting, it should definitely be compatible with DVDs. One of the great advantages of laptops is their ability to be used as portable DVD players. Anyone who travels regularly has seen at least one person pull out a laptop and start watching a movie during the flight. Now that Blu-ray has become the defacto high definition standard, more laptops have these drives. Blu-ray combo drives have all the features of a traditional DVD burner with the ability to play Blu-ray movies. Blu-ray writers add the ability to burn lots of data or video to the BD-R and BD-RE media. Even if a laptop does not have an internal optical drive, it's still possible to use one so long as you have an open USB port for room to attach a USB optical drive. Drive accessibility is important when considering whether to upgrade or replace a damaged drive. It's important to know what you're doing, so you might consider having an authorized technician open the computer. This generally isn't a problem for many people, but in a corporate environment, it can cause increased downtime for a worker. Laptops that have drive bays that are accessible or swappable have the advantage of easy and quick access for upgrades or replacements. In addition to being accessible, it's also important to get an idea of what kind of drive bays there are and what the size requirements may be. For instance, the 2.5-inch drive bays used for hard drives and solid state drives can come in several sizes. The larger 9.5 mm drives often have better performance and capacities but if the drive bay only fits 7.0 mm drives due to a thin profile, you need to know that.